The Olympics come around every four years and showcase the best athletic talents the world has to offer. With the spotlight on high and the world watching, in every event and every sport, medals are awarded as hearts are broken and dreams are crushed. But something more magical can happen as athletes go from previously nameless faces to leaping into our hearts. Women’s gymnastics has always captivated viewers. Maybe it is because gymnastics is so difficult and complicated that it is easy for everyone to look on and appreciate the coutless hours of practice and extreme effort these women put in. Maybe it is because these women are some of the youngest Olympians with most still being teenagers so the youth watching find it easy to relate to these girls while older fans look on with more sensitivity and want these girls to succeed as if they were their own children. Whatever the reason, the sport is always front and center at the Olympics and fans would have it no other way. And much like years past, the magic that brings the girls into the hearts of Americans struck again. Jordyn Wieber became America’s sweetheart as the world saw her push for gold and get left out of the all-around finals by a questionable rule when her score was better than 24 of the 28 girls who ended up competing for the Individual All-Around gold. Aly Raisman became a symbol for maturity and leadership as she earned her spot as captain of Team USA and led them to the team gold. But something even more magical happened to Gabby Douglas. Gabrielle Douglas is a Virginia girl who took the ultimate sacrifice to leave home and move to West Des Moines, Iowa to train with one of the top gymnastics trainers the world has to offer. After nearly leaving for home and quitting gymnastics, Douglas, who stands 4’11” and weighs just 95 lbs, qualified for the Olympics at just 16. Some would say her dreams had come true and that her sacrifices were now worth it. But things just kept getting better for Douglas. 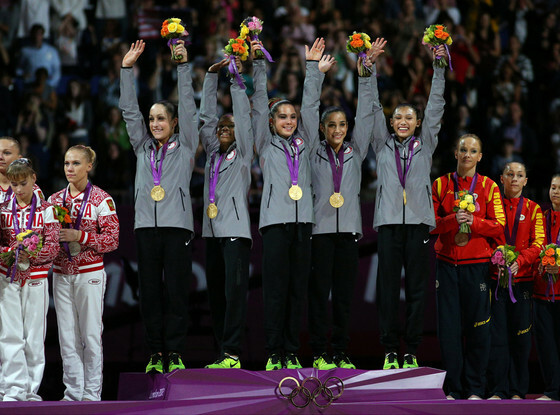 Along with the rest of Team USA, Jordyn Wieber, Kyla Ross, McKayla Maroney, and captain Aly Raisman, Douglas won gold in the team finals. But that wasn’t all. On August 2nd, Douglas won gold in the individual all-around. 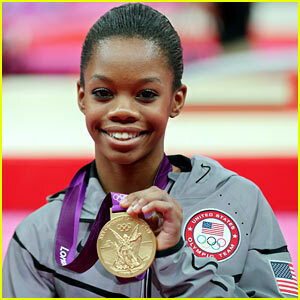 Gabby Douglas is the first African-American woman to win the women’s gymnastics All-Around gold medal. She is also the first woman in American history to win gold in the team and individual all-around at the same Olympic year. And she is the third straight American woman to win gold in the women’s all-around. The magical moment came for Gabby Douglas when she had officially won the all-around gold medal. Gabby Douglas went from a girl who doesn’t even stand five feet tall to a giant American icon and an inspiration to girls across the nation. Though there is no racial limitations on gymnastics, the sport has been predominantly one for white girls. Douglas’ victory serves as an inspiration to girls of all races to push forth with their aspirations in gymnastics. 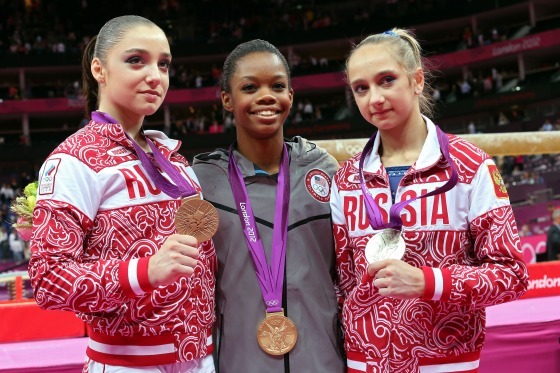 There is more to come for Gabby Douglas and her teamates. Douglas will compete for more gold to add to her collection as she tries to show that she is the best in the world at the uneven bars and the balance beam in a few days. Her teammate McKayla Maroney will seek another gold medal in the vault. Maroney has proven herself before as the best at the event in the world. And teammates Aly Raisman and Jordyn Wieber will battle it out to see if one can take home another gold medal in the women’s floor exercise. The girls will have to compete with their Russian rivals Viktoria Komova and Aliya Mustafina in the individual exercise competitions. As the girls in America captured the hearts of viewers, the girls in Russia did the same to Russian viewers. In Olympic history, Gabby Douglas will from now on sit with gymnastics royalty. She will also go down in American Olympic history with the likes of Michael Phelps and Carl Lewis. The magic of the Olympics was felt when Gabby Douglas took gold. One week ago she was a relative unknown. Today she is an American legend and icon who, along with her teammates, will serve as a great inspiration and a prime example of what hard work and dedication can accomplish.